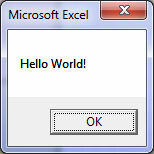 VBA is the back-end programming language used for excel macros. This is how Arena.Xlsm was coded. To access the visual basic interface, you will need to enable the developer ribbon. Here is a handy guide: http://office.microsoft.com/en-ca/excel-help/show-the-developer-tab-or-run-in-developer-mode-HA010173052.aspx Note that it may be different depending on which version of Excel you are using. Once you have the developer ribbon on, click Visual Basic to access the interface. This is code that is run as soon as the workbook is open. In Arena.Xlsm, this is where it prompts as to whether or not you want to start a new game or load a saved game. This will call the subroutine NewGame in the Module “Move”. Lets make that now! This will create a new module called “Module1”. Lets rename this to “Move” using the properties window. This module is where we will have the rest of our code for this part. Lets now create the NewGame subroutine that we called earlier. If you want to, you can verify that this is working by creating a Hello World! application by adding the following line of code into the NewGame subroutine. The Option Explicit simply requires us to declare variables as a type rather than have excel guess at what our variables are. The Option Base 1 makes excel count from 1 rather than 0… basically it just makes everything make a lot more intuitive sense when you are reading code. The 3 “Public” statements are our variable declarations. Public means that those variables are accessible anywhere in the workbook. A variable is a piece of data that your computer keeps in storage. These variables will allow us to keep track of where the player is as they move around. Integer variables are positive or negative whole numbers (within the range of -32,768 and 32,767) and String variables store text. This will spawn our player in cell N12 when the worksheet is opened. We are then assigning that location to the variables: PlayerPositionRow, PlayerPositionColumn, and PlayerCell. So we now have macros that do what we want to do but we need to create a way for the user to actually interface with those macros. For simplicity, I am using a simplified version of the Arena.Xlsm interface, but you can design whatever you want. To assign a macro to an object simply right-click on the object and select “Assign Macro…” Do this for all of your directional buttons. Note that you can also create a button to link to your new game subroutine if you want the player to be able to reset (however this will require you to do some additional checking to ensure you are not creating multiple copies of the player each time you reset. 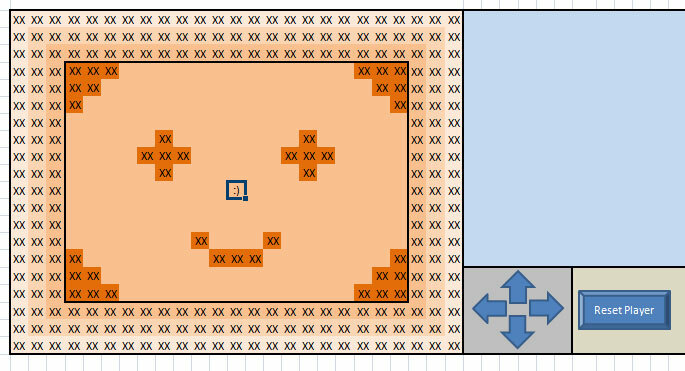 In Arena.Xlsm, I redraw the arena so that the player does not show up in multiple spots when a new game starts). I hope you’ve enjoyed this. Everything discussed in this article can be found in the excel workbook here: VBA4Play Part 1. Please comment below if there is something you want to see in the next part of VBA4Play, or if you have a game idea that you want the community to build together. Also I’d love to get any feedback, did this type of format work well for you? Have you learned something from all of this? If you are more advanced and want to submit your own workbook and tutorial for VBA4Play please e-mail me. Seriously? He wrote an RPG in a spreadsheet — that, in and of itself, is the feat. Millions of people have written games in more advanced languages — there’s nothing special about that. And if he had written this game in, say, C, nobody would care — it would have been a cheesy game. But this is a brilliant accomplishment — something most people would have probably said couldn’t be done. Wanna put it in programming terms — it’s a proof of concept. POCs are not MEANT to be easy to read or maintain. Or put it in Agile terms — he wrote what needed to be written. You wanted him to code for the future possibility of adding a column — if he never decides to expand the maps, that coding work — that you are suggesting — would have been pure waste. So get off the programmer-high-horse and give the man some props for an awesome creation! Quite right. The code’s not bad for someone with his level of experience – I’ve seen far worse from professionals. good job, I will surely follow this series, I loved the game! Congratulations!!! French congratulations ! I play your game from France and i read carefully your vba series. I play myself with vba and excel but only in a “professional” way….I’m sure i will discover some trics with your vba series thanks to share your skills ! Bonne continuation sur cotre site, j’attend avec impatience les autres series ! Can I still do this and still maintain Excel 2007 compatibility? I don’t want to get rid of the joystick buttons because I think most people don’t have an understanding of how to control a spreadsheet-game. But I would definitely be willing to have keyboard input options. You can, but not if you’re wanting to add Mac compatibility. That kind of thing requires Windows API’s, and needless to say it won’t work on the fruity OS. In order to use cursor keys, all you need to do is call your movement macro using the Application.OnKey method using the desired cursor as an argument. Basically any key can be mapped to a macro this way. I’m working on my own VBA/Excel based RPG and your game is a great proof-of-concept. I am an accountant (CPA-candidate) as well. Keep up the awesome work. You, sir, are my hero. I’m an accountant also, and my co-workers think I’m magic with VBA, but I am no where near as fancy as you. I think the idea of VBA discussions is awesome, and I look forward to reading more. My hat is off to you. I really learned a lot from this, will there be a part 2? Yes, I’m hoping to do a part 2 soon. I was trying to figure out whether to do it on Artificial Intelligence or Animation or something else entirely, it depends what I’m trying to build. I was hoping that the community would want to make a type of game and then I would make tutorials on how to make that game. However, that didn’t happen so I’ll probably try to keep it simple. If you have any suggestions please let me know! Thanks for encouraging me to actually get on this! The Select command isn’t required if you are writing the code, it is only generated when you record macros and select cells. (the FormulaR1C1 is also from recording the macro, and since 🙂 isn’t a formula, Value is a “better” way to do it). You did say you want beginners to learn from professionals and vice-versa, so perhaps someone will find this useful. ^^ agreed completely. I have select in there because in the game (Arena.Xlsm) the select is used for targeting the ranged attacks, if the player is moving and not in combat, the select resets to the player rather than maintain focus on the enemy. I just tried this sample for Part 1 and when I reset the game, my old player is still on the screen. This sub fixes that problem, and can be attached to the ResetPlayer button for those who want it. ‘ Clear the current player position and restart the game. (Note,using Call to call the NewGame subroutine is optional, you can just write the word NewGame and it will work as well).